A suicide bomber has attacked a Shia mosque in the northern Iraqi city of Kirkuk, killing at least eight people, police say. The mosque was being attended by relatives mourning victims of violence in the city the day before. Hours earlier, at least 12 people were killed in car bomb attacks on mainly Shia districts of the capital Baghdad. On Wednesday, at least 34 people died in bomb attacks across Iraq, several of which targeted Shia areas. Iraq has seen a sharp increase in sectarian violence in recent weeks. It comes amid growing tension between minority Sunni Arabs and the Shia-led government. In the latest attack in Kirkuk, a bomber was stopped by police from entering the building and detonated an explosives-rigged belt near the entrance, a senior police officer was quoted by AFP news agency as saying. At least 18 people were wounded, he added. Police in Baghdad said a car bomb killed nine people near a bus and taxi stop during Thursday morning's rush hour in the city's eastern district of Sadr City. "When the explosion happened, it was chaos," said shop owner Hussein Mahdi. "People were running everywhere to evacuate the victims. I saw two bakery labourers who were completely burned." Shortly afterwards, another car bomb hit a small market at a taxi stop in Baghdad's eastern suburb of Kamaliya, killing three civilians, police added. In Wednesday's violence in Kirkuk, a car packed with explosives blew up near a government building in the city centre, killing eight people. An hour later another car bomb exploded in the same area, killing two children. 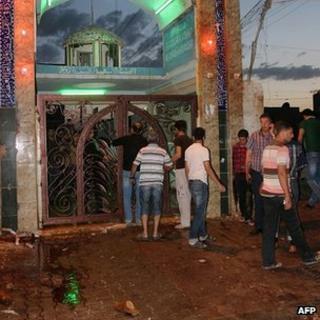 In Baghdad, 11 bombs were detonated on Wednesday evening in predominantly Shia districts. Most were car bombs, at least two targeting restaurants. Sadr City was worst hit, with three bombs killing seven people and wounding another 37. Violence across Iraq over the past month began after an army raid on a Sunni anti-government protest camp near the northern town of Hawija that left 50 people dead. The demonstrators accused the government of targeting the Sunni community.